The final MotU Minis set really goes far afield! The heroic figure in this pair is King He-Man, an incarnation of the character created for MotU Classics - he was one of the characters I would have bought, if Mattel didn't sell out right away. At some point in the future, He-Man finally defeated Skeletor, but when he got home, he discovered his father had died, so he accepted his duty and ascended the throne. As king, Adam wears more ceremonial garb than he used to. He's got a silver breastplate with gold accents and his standard red cross symbol in the center. His loincloth is blue, and he wears technological silver boots. Like his dad, he wears a blue cape, but it sticks so far out behind him that the toy can only stand if you lean it against something. Not good. To show his age, he has longer hair and a beard, both starting to gray. He's armed with his scepter, and a version of the 2002 Power Sword. King He-Man's adversary may at first seem like an unusual choice - why would you put the most powerful (retired) man in the world up against Skeletor's dumbest henchman (which is really saying something, considering how utterly moronic they all were)? But there may be a good reason for it! Remember two things: one, this is the future, and two, lobsters are functionally immortal. There's no reason to assume Clawful wouldn't still be around and causing trouble years from now. Clawful is a mix of styles. Most of him is the classic design, from the blue boots and belt to the silly Muppet eyebrows, but then his back is the giant shell he only got in Mo2K. Way to bring that back! Heck, these Minis could be 100% 2K2 based and that would be just fine. 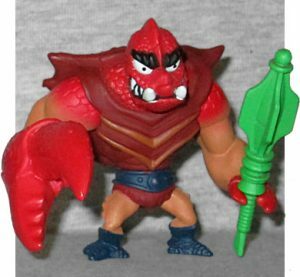 Clawful's a little larger than the other figures, befitting his status as Skeletor's largest goon, and can hold his green cudgel in his smaller left claw. Buy all six MotU Minis sets, and you'll be able to build your own miniaturized Castle Grayskull. Set #6 includes the top of a tower. It has a little space at the top for a figure to stand, and will plug into the face. 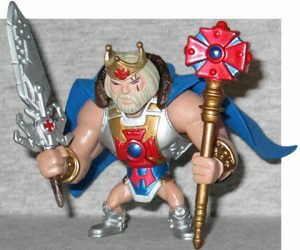 King He-Man is a neat design, but it would be nice if he could stand up on his own (or if he included a base, or even just some footpegs on the Grayskull tower). Clawful translates well to the superdeformed style, and he has the better shell design. They only make a little sense together, but they make for a pretty nice two-pack. 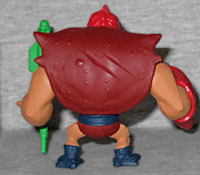 This entry was posted in blog exclusive review, Mattel and tagged He-Man, MotU. Bookmark the permalink.